I had a great time with my children and my sister in the hotel. It is located in one of best spots in city and overall I had best access to every place. The management was excellent and I had a great time with my family there. It was very clean and friendly hotel. Breakfast was not included and there was a charge for parking. Great service and room. Parking and internet access fees were disappointing. Daily parking charges of $14. The hotel was clean and the front desk staff was friendly. The breakfast buffet was ok but should not have been priced so high. Would be nice to have a price for 3-5 yr olds who do not eat that much. It was clean for the most part. The walk to and from the parking area is not enclosed. It was raining and the doors do not open automatically to bring in luggage. 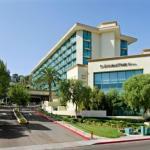 The Doubletree Club Hotel is ideally situated in Hotel Circle, in Mission Valley, San Diego. With amenities such as a 10,000 square foot event space and family suites, the Doubletree hotel offers plenty both for those traveling on business and those traveling for leisure. Numerous attractions are located just on the doorsteps of the hotel, such as Sea World San Diego and the San Diego Zoo. After a long day working or playing, relax at the outdoor heated pool and grab a bite to eat at the delicious Panini Grill & Bar. The hotel features 219 hotel rooms and suites. Rooms feature the Sweet Dreams bed by Doubletree, refrigerators, and Wolfgang Puck coffee. Each room has a 32 television while bathrooms feature products by Neutrogena. Family suites are also available which feature separate bedrooms for parents and kids, and on-demand Nintendo video games. Begin your day with a delicious breakfast at the Panini Grill & Bar which serves a hot breakfast buffet daily, or have a lie in and order room service instead. If you would prefer to work out, feel free to take advantage of the fitness center featuring free weights, treadmills and elliptical, or take a dip in the outdoor pool. If you need to catch up on some work take advantage of the complimentary high speed Internet access. There is also a 24/7 business center available as well. If you're looking for a hotel that is centrally situated with excellent amenities, then look no further. The hotel offers excellent amenities whether your trip takes you to San Diego on business or pleasure. Although dining options at the hotel are limited, the hotel is located just minutes away from numerous shops and restaurants. You will find the staff friendly and willing to help in any way they can.